Clinical Senior Lecturer Honorary Consultant in Haematology & Coordinator of ATECT – "Advanced T-cell Engineered for Cancer Therapy"
Dr. Martin Pule leads optical imaging in the UCL Centre for Biological Imaging. He and his group work on engineering mammalian cells for therapeutic applications. Most of their work involves engineering proteins and vectors for eukaryotic expression, testing in small animals and then with some promising approaches, moving to clinical studies. While working at Baylor College of Medicine, Houston, as a traveling Fulbright scholar, Martin Pule was the first to describe third generation forms of these CARS2 which transmit activation, proliferation, and survival signal to the transduced T-cells, the form of which have been used as a template for many different chimeric antigen receptors since. While at Baylor, Martin Pule also engineered a novel suicide gene, “iCasp9”, which is in widespread use and currently in clinical studies. Martin Pule’s work in Baylor culminated in testing of a CAR in clinical study in children with neuroblastoma. 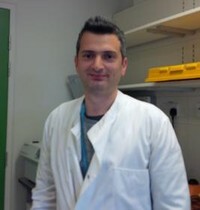 He is also the principle investigator in an open clinical study of engineered T-cells in UCLH.